In the News - TsoInspired! We are proud that our film "STAR 3-to-3rd Multilingual Cognition: Part 1 - Sign Language" is featured in the Signing Time! Blog and in their widely distributed newsletter. The STAR School is Currently Featured in Scholastic's Parent and Child Magazine as one of "The Coolest Schools in America," our media arts program there is highlighted in the article. This charter near the Navajo Nation is the ?rst public school to be off the electric grid. Hundreds of solar panels and ?ve wind turbines generate all the necessary power to run its multiple buildings (including one housing a state-of-the-art media program) as well as an electric well that waters the property's orchards. Soon, a network of monitors will allow students to help maintain and learn from the system by tracking and graphing production and consumption. Named for the acronym "Service to All Relations," the school's philosophy is based on the Navajo principles of K'e (all things are inextricably linked) and peacemaking, which promote respect for others and the land. "I like to put a lot of heart into my films," said freshman Kira Butler, 14, whose film work at STAR School has already taken her across the U.S. and to Italy. "Through filmmaking I understand who I am in the world community." "When it comes to mainstream media, indigenous youth are often seen in the negative or are portrayed as historical or cultural subjects in the past," said Rachel Tso, the media arts educator who developed the film curriculum. "It's important for students to represent themselves using their own voice, not someone else's." The main focus is on what Tso terms "place-based media arts." "It describes what we're doing with our students through film," she said. "It reconnects kids with their community, reconnects their place in the community and reconnects them with their family, including their elders." TOP: Kira Butler, from the STAR School in Leupp, Ariz., is interviewed by an Italian journalist at the Venice Film Fest. Taylor Long, left, and Larissa Luther, both 12, stand next to their media instructor, Rachel Tso, inside the multi-purpose room Thursday morning at STAR Charter School on Leupp Road. They are standing in front of the backdrop they normally use when conducting film interviews. 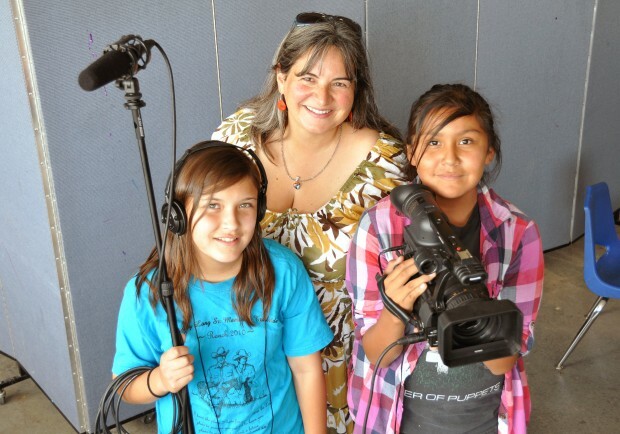 The students have taken two summer video workshops with Tso and are members of her regular media arts class, which began July 20 at the school. They helped on "Redbird Saves the Corn," one of the five STAR student films being shown at the annual Navajo Festival of Arts and Culture next weekend. In the shade of a strawbale building on the campus of STAR Charter School, two girls hovered over the viewscreen on an HD video camera, wondering why they couldn't see the image better. "It's a neutral density filter," explained Rachel Tso, their media art instructor. "When you're outside, you need the ND filter." The students, Taylor Long and Larissa Luther, both 12, worked this summer on the film "Redbird Saves the Corn," which is a traditional Spider Woman story told through lightbox animation. It is the nation's first solar-powered, off-the-grid public school campus. Films produced thus far have asked some of these questions: How do you make kneel-down bread? What are the benefits of solar power? What are the traditional peacemaking techniques on the Navajo Nation? How do you conduct a sweatlodge ceremony? FLAGSTAFF, Ariz. - Often the mention of a museum brings to mind collections of the past. Nothing can be further from that image than the 61st Annual Navajo Festival of Arts and Culture presented by the Museum of Northern Arizona, which offered a lively picture of a vibrant, living people. Collectors saw exemplary examples of Navajo jewelry, folk art, pottery, fine art, sculpture, textile and baskets, and performances. The rooms and hallways were packed on Aug. 7, despite the day-long rain. This year, two outstanding films were presented, both honoring Navajo women-"In the Footsteps of Yellow Woman," and "Hearing Radmilla." "In the Footsteps of Yellow Woman" was written and directed by 14-year-old Camille Manybeads Tso as an eighth grade project when she was just 13. The 27-minute docu-drama chronicles the courageous journey of Tso's great-great-great grandmother during the Long Walk. 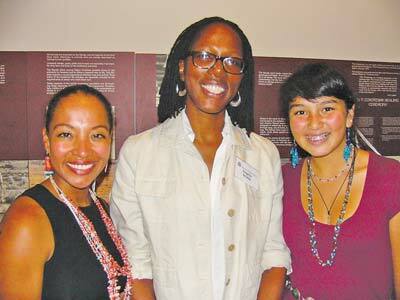 Tso recounted how she learned about her warrior ancestor, and how her imagination was kindled. "As I was growing up, I often visited my grandmother, Mae Wilson Tso," Tso said. "We were out on a walk one day, and she was talking to me, and suddenly she stopped and pointed to the ground. She said, "This is the place where your great-great-great grandmother Yellow Woman was shot."